European Conference on Antennas and Propagation (EuCAP), Krakow, Poland, 2019. A pattern reconfigurable antenna for 2.6 GHz LTE is flush-mounted in a chassis antenna cavity. The driven element is a top-loaded monopole, that is steered based on the electronically steerable parasitic array radiator (ESPAR) principle. The radiation pattern can be configured in 45 degree steps, e.g. front, diagonal front-right, right, etc. The cavity prototype is made from carbon fiber reinforced polymer and includes a chassis mockup. Antenna performance is evaluated based on measured gain patterns, which show that the antenna retains its reconfiguration capabilities when it is flush-mounted. Further, a parametric measurement study with regards to antenna height inside the cavity is performed to investigate the option of mounting an electronics module underneath the antenna. IEEE Access, vol. 7, pp. 20083-20090, 2019. An automotive concept for vehicular communications is proposed that utilizes the potential of the roof area for antennas. Antennas are distributed in cavities and on shelves in the center and on the front and rear roof ends. The arrangement of antennas on the roof allows better radiation to the front andback of automobiles than shark-fins and single cavities. 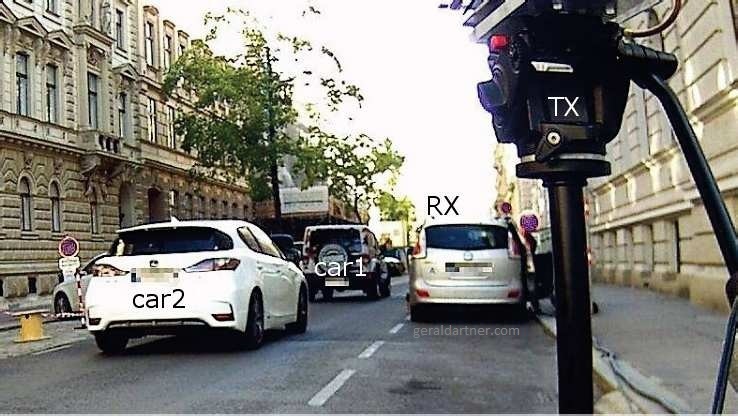 Combining several modules provides space for further antennas, sensors and integrated front-ends, as well as better spatial separation for multiple-input multiple-output (MIMO) arrays beyond 5G, and cooperative connected and automated driving. A prototype was developed and built into a car chassis. Measured data were analyzed and evaluated in the view of coverage for vulnerable road users and on correlation for MIMO. 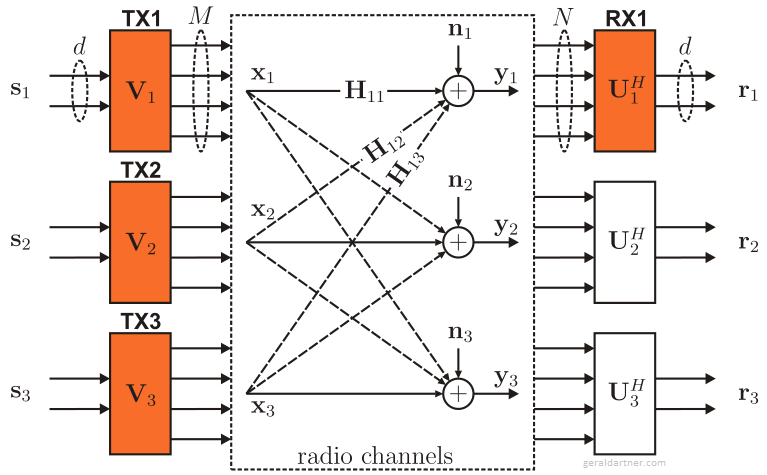 IEEE Antennas and Wireless Propagation Letters, vol. 17, no. 12, pp. 2399-2403, 2018. Cooperatively driving cars benefit from increased coverage towards driving direction for communication with vulnerable road users. Antenna cavities were designed, prototyped and measured for integration into car roofs above the windshield. Two different antenna cavities were investigated. 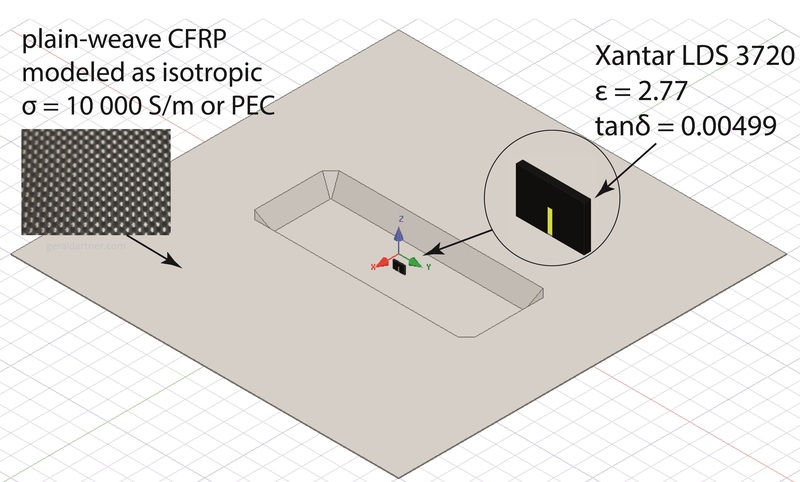 First, an antenna cavity made from carbon fiber reinforced polymer was measured without a vehicle, to obtain general results without model specific influence. Second, a metal cavity was built into the roof of a sedan type passenger car to include the marked effects of the car body and provide a proof of performance. 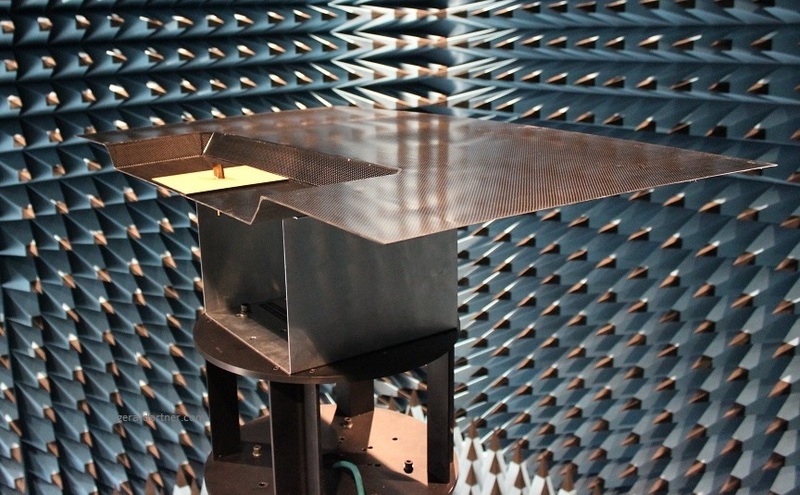 Gain patterns were measured in anechoic chambers. Results show that the antenna structure and mounting position are suitable for omnidirectional radiation with increased radiation towards low elevation angles in driving direction. IEEE International Symposium on Personal, Indoor and Mobile Radio Communications (PIMRC), Bologna, Italy, 2018. 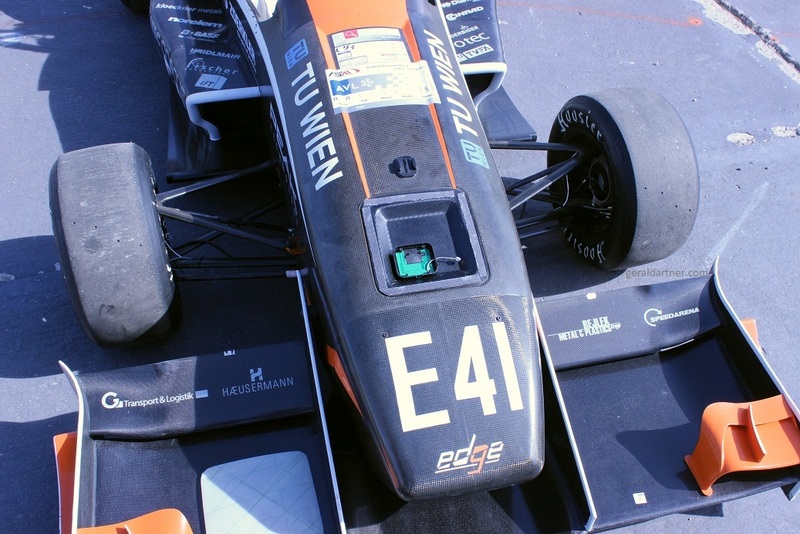 A conformal antenna cavity for the mononoque of racing cars is proposed and prototyped from carbon-fiber reinforced polymer. Performance is evaluated with measured S-parameters and measured radiation patterns. European Conference on Antennas and Propagation (EuCAP), London, United Kingdom, 2018. Cavities built into the vehicle chassis have recently emerged as receptacle for hidden antennas. In the automotive sector they potentially replace the roof mounted shark-fin antenna modules. Simulation models for chassis antenna cavities are critical, because they must both accurately predict antenna performance, while staying computationally reasonable. Moreover, if the chassis of electric cars, airplanes and boats are built with carbon fiber reinforced polymer, then a model for the composite laminate is required. In this paper a simple simulation model for chassis antenna cavities is developed. The carbon fiber composite material is modeled as a linear, homogeneous and isotropic conductor, and several cavity geometry details are omitted. Simulation results are in good agreement with measurements in the frequency band at 5.9 GHz for intelligent transport systems. International Symposium on Wireless Personal Multimedia Communications (WPMC), Yogyakarta, Indonesia, 2017. Pattern-reconfigurable antennas for the 2.45GHz ISM band are concealed inside a chassis antenna cavity. Three antennas are designed to reconfigure between near-optimum radiation patterns for urban scenarios by toggling between front/back and left/right radiation. The three antennas follow distinct design principles and have different gain switching capabilities. Antenna performance is evaluated based on gain pattern measurements. It is shown, that the antennas retain their reconfiguration functionality when they are placed in the chassis cavity beneath the vehicle's roof. Dissertation, Technische Universität Wien, Vienna, December, 2017. Vehicles increasingly communicate with their surrounding environment. They are no longer mere receptors of radio broadcasts, but actively exchange information with their surroundings. These communicative vehicles will radically change our view on transportation. They enable cooperative driving and are used as mobile access nodes for telecommunication networks - no longer just moving combustion engines. Extended radio frequency hardware is the technical basis for this increase in wireless vehicular communication. The critical part of the communication system are the antennas, as they have to be placed outside the vehicles hull and therefore become interdependent with vehicle design. This dissertation examines the influence of carbon fiber reinforced polymer on vehicular antennas and the development of an antenna cavity for vehicles. Together these findings secure enough construction space for antennas in future light-weight constructed vehicles. Electric cars are increasingly constructed with chassis made from Carbon Fiber Reinforced Polymer (CFRP). This requires the characterization of these materials for vehicular antennas. Material samples are measured inside rectangular waveguides and the material parameters are estimated with the Nicolson-Ross-Weir method. Measurement results show, that the electric conductivity of CFRP with twill-weave and CFRP with fiber shreds on the surface are approximately isotropic in the investigated frequency range around 6 GHz. This motivates the use of recycled CFRP. Sustainable materials are in this case also optimal for antenna applications. The transition from metal to CFRP chassis influences monopole antennas, which are currently widely used in automotive applications, as these antennas use chassis parts as ground plane. 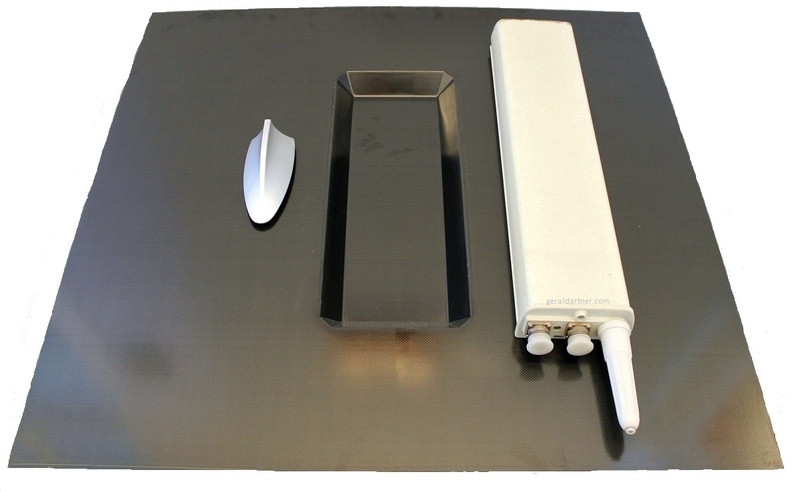 Both narrowband and wideband monopole antennas are measured on ground planes manufactured from different CFRP. A cavity for vehicular antennas is designed, manufactured, measured and evaluated. The cavity is larger than currently used roof-mounted shark-fin antenna modules and can be manufactured as part of the chassis and hidden therein. As proof that the production of such a cavity is realizable for electric cars, a prototype is built from CFRP. To show feasibility for antennas, several antennas are measured and evaluated inside the cavity. Investigated antennas include a monopole antenna and an inverted-F antenna, both manufactured as laser-structured injection molded parts; a broadband conical monopole antenna and intelligent antennas with reconfigurable radiation patterns. Detailed measurement based evaluations of the antennas inside the cavity show that the cavity concept is feasible. Influences of the cavity on the functionality of the antennas inside are also analyzed by measurement. Strong influences on the antennas occur at frequencies in the high single-digit gigahertz range, where the cavity is electrically large. IEEE Vehicular Technology Conference (VTC Fall), Toronto, Canada, 2017. The number of antennas mounted on vehicles keeps growing. 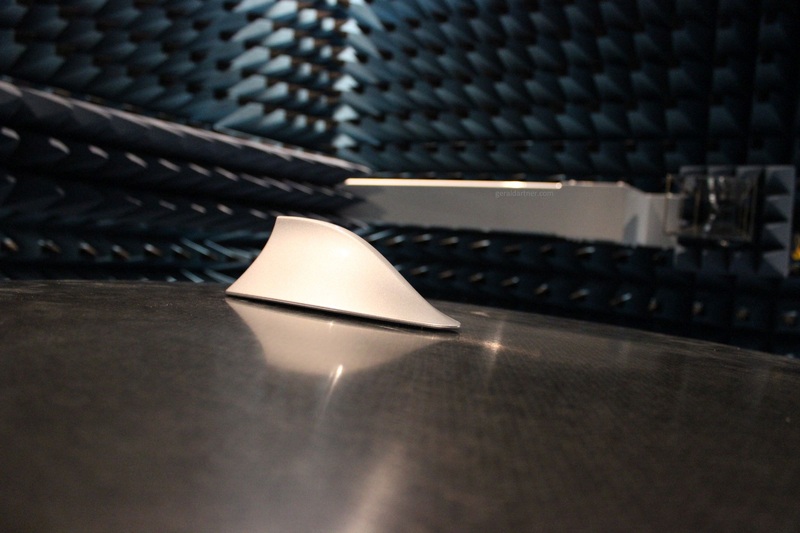 Antennas in hidden modules will replace or supplement antennas in shark-fin modules. Chassis antenna cavities were recently proposed as large antenna modules, which can be built, and concealed, inside the vehicle chassis. Recent results of multiple antennas inside a chassis antenna cavity are presented. An inverted-F antenna and a conical monopole antenna are compared, based on measurements performed in an anechoic chamber. Measurements suggest that the position of the antenna inside the cavity has a significant influence on the gain pattern. Further measurements of frequency sweeps are needed, but prior to that exchangeable cavity bases are required. IEEE-APS Topical Conference on Antennas and Propagation (APWC), Verona, Italy, 2017. Chassis antenna cavities were recently introduced as large, hidden, antenna modules. Testing different antenna configurations inside the module would require cutting several holes into the cavity floor. Manufacturing of several prototypes is not feasible, especially for carbon-fiber reinforced polymer chassis; flexible solutions are desired. Exchangeable cavity bases for chassis antenna cavities are proposed, designed and manufactured. Antenna measurements show the feasibility of the concept. IEEE International Symposium on Antennas and Propagation (APS), San Diego, California, USA, 2017. Chassis cavities have recently been proposed as a new mounting position for vehicular antennas. Cavities can be concealed and potentially offer more space for antennas than shark-fin modules mounted on top of the roof. 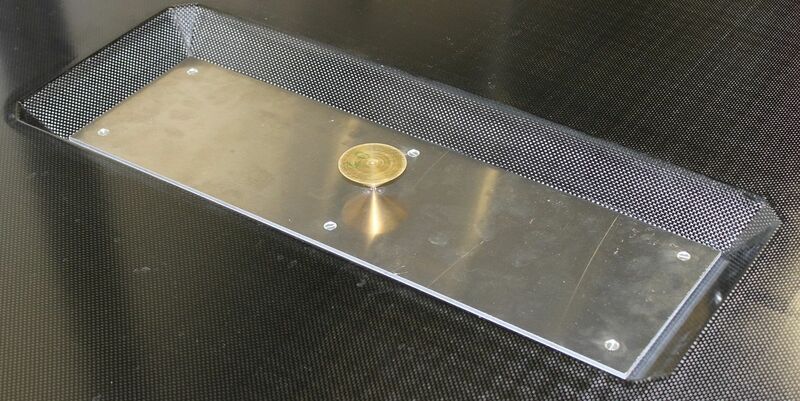 An antenna cavity for the front or rear edge of the vehicle roof is designed, manufactured and measured for 5.9 GHz. The cavity offers increased radiation in the horizontal plane and to angles below horizon, compared to cavities located in the roof center. International Workshop on Antenna Technology (iWAT), Athens, Greece, 2017. Chassis integrated antenna cavities offer ten times the space of conventional automotive roof mounted antenna modules and can be fully concealed beneath the roofline. A pattern reconfigurable antenna for 2.6 GHz LTE is measured inside an automotive chassis cavity. The antenna can be electrically reconfigured to radiate towards the front, back, left or right side of the vehicle. Measurement results show that the antenna retains this ability when being hidden beneath the roof, proving that it is possible and feasible to hide antennas utilizing pattern diversity inside chassis cavities. IEEE Antennas and Wireless Propagation Letters, vol. 16, pp. 1415 - 1418, 2017. A concealed vehicular carbon fiber reinforced polymer (CFRP) cavity in the roof which contains antennas is proposed, prototyped and measured. Compared to state of the art roof mounted shark-fin modules this offers significantly more room for antennas and radio frequency hardware, thus enabling a smooth transition of vehicular connectivity towards 5G. 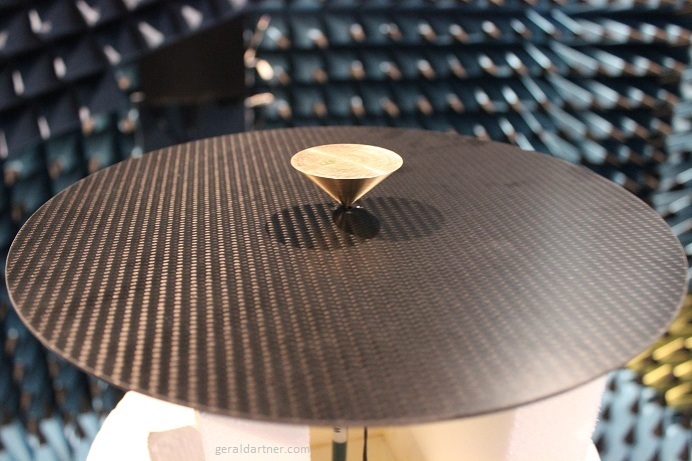 Three antennas were prototyped and embedded in the cavity: Two laser direct structured (LDS) antennas (inverted-F antenna for 2 GHz, monopole for 5.9 GHz), as well as a broadband conical monopole antenna milled from brass that characterizes the feasible frequency range from 2 to 6 GHz by measurement. It is shown that near-omnidirectional radiation from the concealed automotive antenna cavity is achievable. IEEE-APS Topical Conference on Antennas and Propagation (APWC), Cairns, Australia, 2016. Rising demand for vehicular communication and cooperative movement have led to an increase of vehicle mounted antennas. A carbon fiber reinforced polymer cavity is presented, that can be integrated into the vehicle chassis. The concealed cavity is large enough to house the anticipated antennas for present and future vehicular communication. Influence of the cavity onto antennas is demonstrated with calibrated gain measurements on the example of a 5.9 GHz monopole antenna for intelligent transportation systems. The cavities impact on antenna performance is found to be much smaller than influences of the car itself. Progress In Electromagnetics Research M, vol. 67, pp. 1-8, 2018. Carbon fiber reinforced polymer (CFRP) is measured as reflector material for millimeter waves at 60 GHz. Reflectivity is measured to characterize material anisotropy in a mono-static setup. Disc shaped material samples are rotated in steps of one degree. Four commonly employed CFRP are investigated: unidirectional fibers, plain-weave, twill-weave and fiber shreds. Results show that the unidirectional CFRP and twill-weave CFRP are anisotropic, while the remaining materials are isotropic within measurement accuracy. Electronics Letters, vol. 54, no. 6, pp. 359-361, 2018. Twill-weave carbon fibre reinforced polymer is measured as reflector material for electromagnetic waves at 60 GHz. The reflectivity at millimetre wavelength shows a predominant direction, which coincides with the diagonal pattern of the twill's top layer. In the remaining directions the investigated 2/2 twill-weave composite's reflectivity is almost isotropic. International Journal of Antennas and Propagation, Volume 2017, Article ID 6152651, 2017. A carbon fiber reinforced polymer (CFRP) laminate, with the top layer consisting of shredded fibers, is proposed and manufactured. The shredded fibers are aligned randomly on the surface to achieve a more isotropic conductivity, as is desired in antenna applications. Moreover, fiber shreds can be recycled from carbon fiber composites. Conductivity, permittivity and permeability are obtained with the Nicolson-Ross-Weir method from material samples measured inside rectangular waveguides in the frequency range of 4 to 6 GHz. The decrease in material anisotropy results in negligible influence on antennas. This is shown by measuring the proposed CFRP as ground plane material for both a narrowband wire monopole antenna for 5.9 GHz and an ultra-wideband conical monopole antenna for 1-10 GHz. For comparison, all measurements are repeated with a twill-weave CFRP. European Conference on Antennas and Propagation (EuCAP), Paris, France, 2017. Carbon Fiber Reinforced Polymer (CFRP) or generally Carbon Fiber Composites (CFC) are increasingly utilized in lightweight construction. Large CFRP parts such as chassis or fuselages are utilized as antenna ground planes. However, radiation characteristics of antennas designed for metal ground planes change when mounted on anisotropic composites. 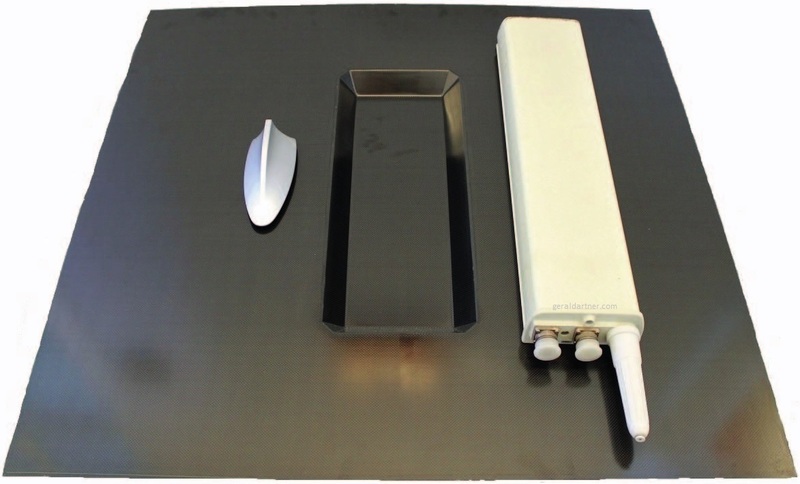 In this paper the influences of CFRP ground planes on the radiation characteristics of antennas in the range from 1 - 10 GHz are investigated with measurements of conical monopole antennas. Measurements show that ground planes from unidirectional CFRP severely distort radiation patterns, while the influence of woven plies is small. European Conference on Antennas and Propagation (EuCAP), Davos, Switzerland, 2016. The introduction of carbon-fiber composites in chassis production changed the materials in the vicinity of vehicular antennas. 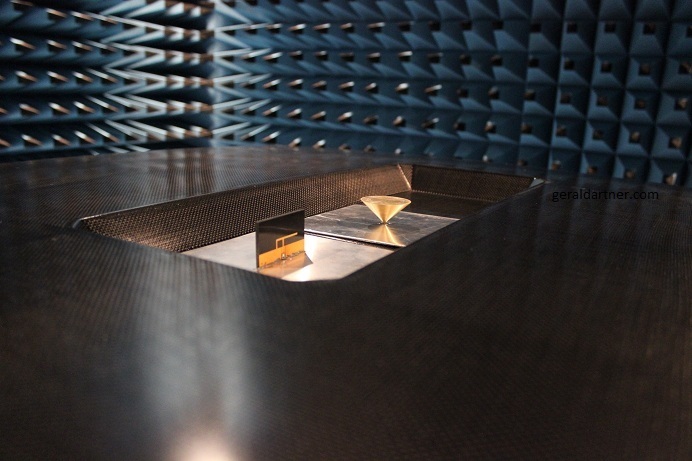 The two IEEE 802.11p antennas of an automotive antenna system are measured on a carbon-fiber roof and an aluminum sheet. Gain patterns are in good agreement, radiation efficiency on the carbon-fiber roof is about ten percentage points lower than on aluminum. IEEE-APS Topical Conference on Antennas and Propagation (APWC), Palm Beach, Aruba, 2014. The impact of carbon fiber composites (CFC) as a ground plane material on antenna performance is investigated. CFC are lighweight materials that, due to their high mechanical durability, are increasingly used as chassis material for cars. Their electrical characteristics are anisotropic and dependent on the manufactured structure, which is expected to influence the radiation pattern. 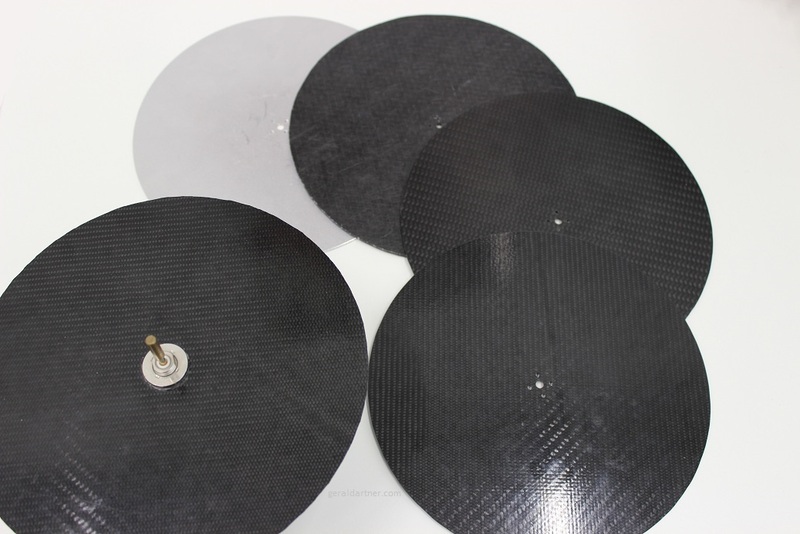 Simple monopole antennas for 2.45 GHz (ISM) and 5.9 GHz (ITS G5) are mounted to circular ground planes made of three diferent CFC and aluminum sheets. The influence on antenna performance is investigated with calibrated gain, return loss and the radiation pattern measurements. IEEE 8th Sensor Array and Multichannel Signal Processing Workshop (SAM), La Coruna, Spain, 2014. Interference alignment has been proposed as a transmission technique to cancel the interference for the K-user interference channel at high signal-to-noise ratio. 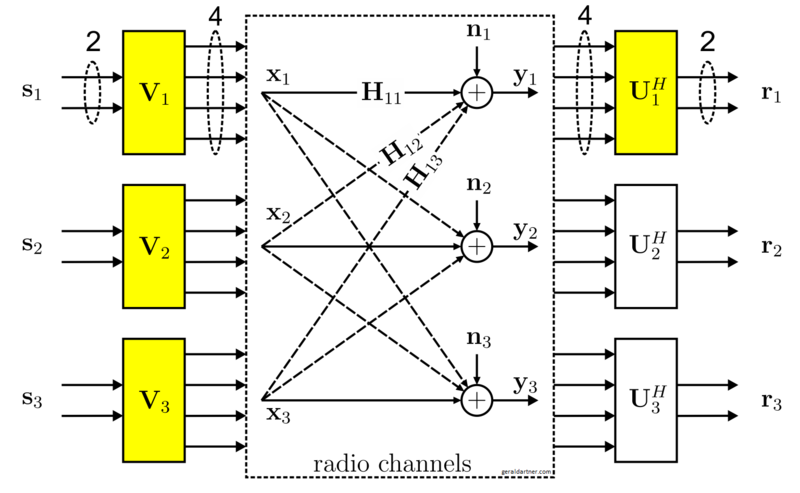 In the case of multiple-input multiple-output (MIMO)-transmission the interference can be aligned in a subspace of the receiver antennas. In this work we investigate the impact of outdated channel state information (CSI) due to temporal channel variations on the performance of interference alignment. Experimental transmissions of real-time precoded signals from an indoor and outdoor MIMO testbed exhibit performance degradation due to outdated CSI. Furthermore, a model is proposed and evaluated that describes the temporal channel fluctuations based on these measurements. Interference alignment is a linear precoding technique that eliminates interference in the K-user interference channel. We present measurement results and identify the performance limiting factors that occur under real conditions. In our setup, we found the main causes of impairment to be outdated channel state information in varying channels, thermal noise at the receiver and transmit impairments. We propose a simplistic channel model that is capable of capturing these effects and allows to investigate their impact on the achievable rate. Diplomarbeit (Master's Thesis), Technische Universität Wien, Institute of Telecommunications, Vienna, September 2013. Modern mobile communication systems are designed based on the cellular principle. The efficiency of such systems is primarily limited by interference from neighboring base stations at the cell edge. In recent years various schemes have been developed to minimize interference through base station cooperation. One such promising scheme is interference alignment (IA). Although theoretically well understood, measurement based evaluations are rare. Interference alignment (IA) relinquishes half of the available data streams of a mobile connection to align the interference in their subspace and promises an interference free transmission on the remaining data streams. IA uses linear transmit and receive filters and requires global knowledge of the communication channels to calculate these filters. 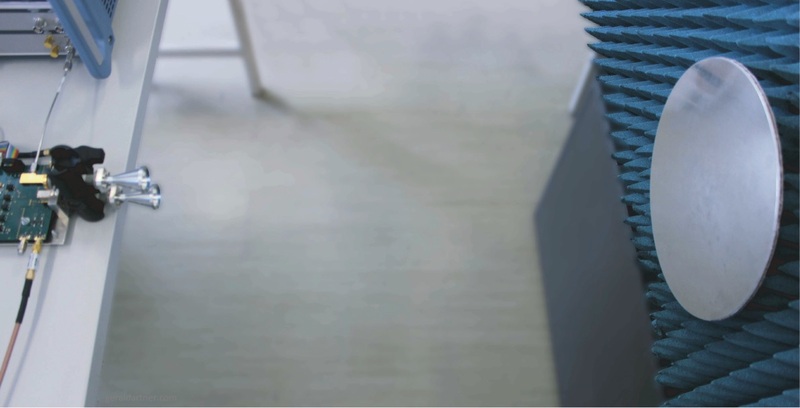 Furthermore IA requires various assumptions regarding the communication channels and the communication network. An important assumption is that the radio channels remain constant from their measurement on to the transmission of the data. This thesis shows in a scientific, on modern communication systems based, measurement environment that practical channels allow the application of IA and presents measurements that show the impact of changing channels on the efficiency. First the theoretical basics and measurement methods of characteristic figures are summarized. 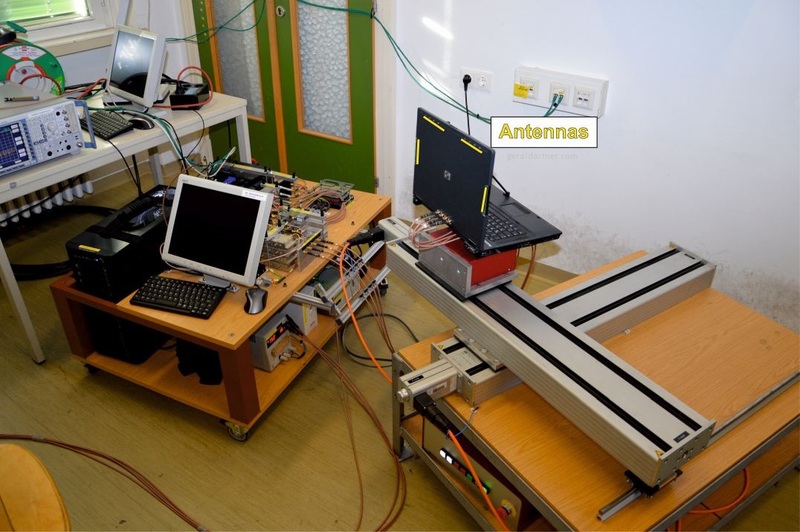 Then the used measurement system, the Vienna MIMO testbed (VMTB), is specified. Differences to a commercial system are clarified and the developed software explained. Additionally the performance of IA under changing channels is quantitatively investigated with the use of mutual information. International Symposium on Wireless Communication Systems (ISWCS), Ilmenau, Germany, 2013. Interference Alignment (IA) is a linear precoding scheme for the K-user interference channel with high signal to noise ratio. Ideally, interference is completely suppressed and each user is able to achieve half of the single-user multiple-input multiple-output (MIMO) degrees of freedom. We use the Vienna MIMO testbed to evaluate the feasibility of IA in realtime, in a heterogeneous outdoor to indoor and indoor to indoor scenario representative of an urban scenario. We evaluate the accuracy of alignment and provide benchmarks for typical delays in such a setup. 24th Telecommunications Forum (TELFOR), Belgrade, Serbia, 2016. Molded interconnect devices (MID) allow the realization of electronic circuits on injection molded thermoplastics. 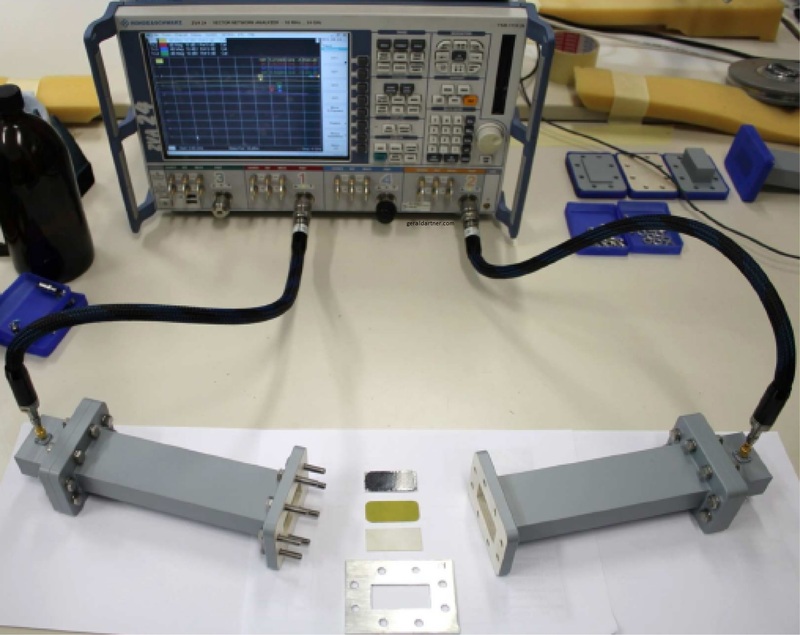 MID antennas can be manufactured as part of device casings without the need for additional printed circuit boards or attachment of antennas printed on foil. Baluns, matching networks, amplifiers and connectors can be placed on the polymer in the vicinity of the antenna. A MID dipole antenna for 1 GHz is designed, manufactured and measured. 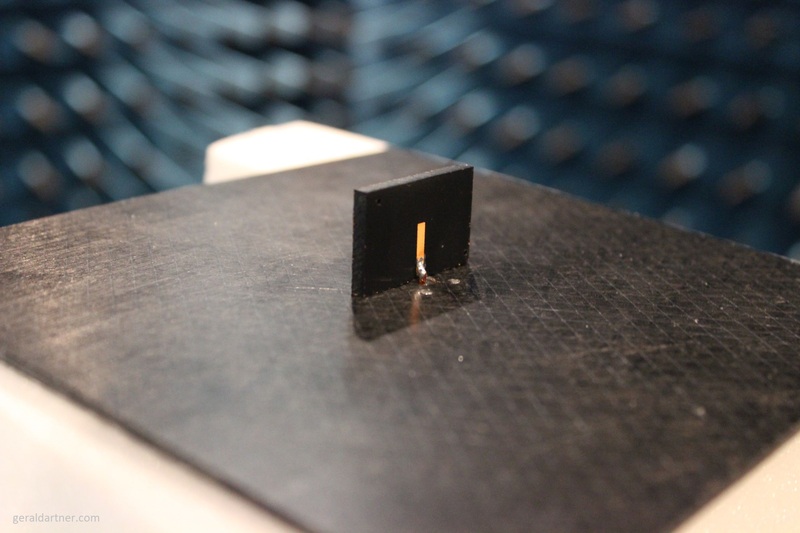 A prototype of the antenna is built with laser direct structuring (LDS) on a Xantar LDS 3720 substrate. Measured return loss and calibrated gain patterns are compared to simulation results. IEEE International Conference on Microwaves, Communications, Antennas and Electronic Systems (COMCAS), Tel-Aviv, Israel, 2015. Recent advancements in production materials for cars replace well-known ground plane materials for vehicular antennas. Carbon-fiber composites (CFC's) replace steel as chassis material, which leads to reduced radiation efficiency. As the production processes of shark-fin antenna modules shift towards laser direct structuring (LDS), it is investigated, if antenna efficiency can be increased by the introduction of a LDS ground plane. Differences in antenna performance are presented on the example of simple LDS and wire monopole-antennas for 5.9 GHz (IEEE 802.11p, ITS G5). 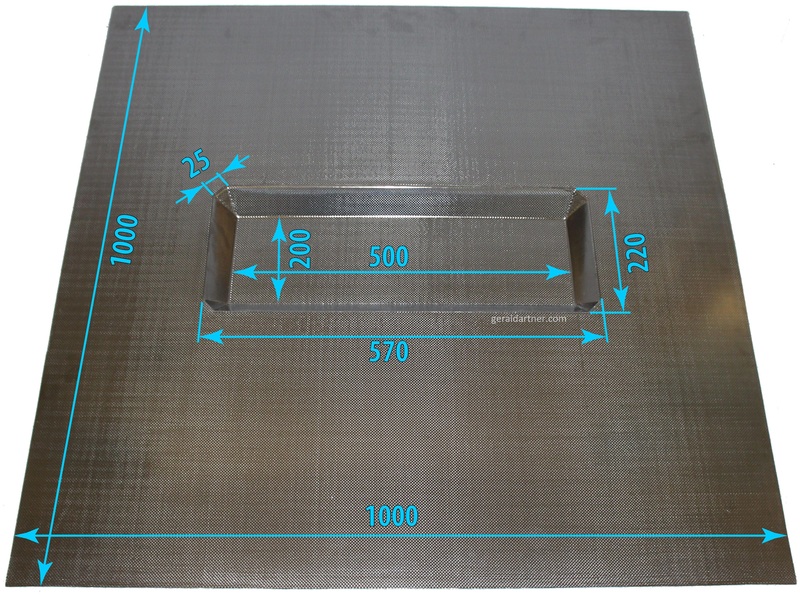 Gain, efficiency, return loss and the radiation patterns of an LDS design, a CFC and an aluminum ground plane are compared. 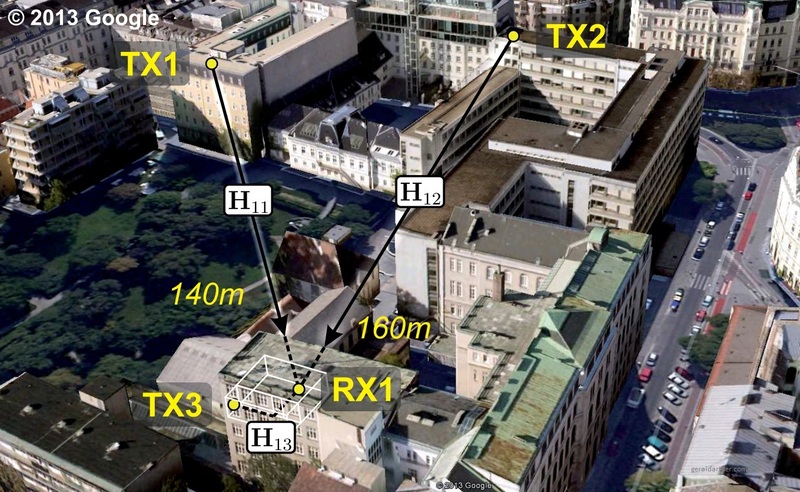 We report results from real-world millimetre wave vehicle-to-vehicle channel measurements carried out in an urban street environment, down-town Vienna, Austria. Channel measurements have been acquired with a time-domain channel sounder in the frequency band 59.75-60.25 GHz with a frequency resolution of approximately 5 MHz. We estimate the local scattering function for sequential stationarity regions in time. A multitaper estimator is used to precisely define Doppler and delay resolutions. Estimates for delay and Doppler profiles are evaluated from the local scattering function for several overtaking vehicles at a variety of speeds and for different types of vehicles. The results show that passenger cars are associated with a single Doppler trajectory, whereas larger vehicles, such as trucks, show up in the data with multiple Doppler trajectories. We conducted drive test measurements in a live LTE 1800 MHz network to evaluate mobile network performance of User Equipments (UEs) located inside and outside a pickup truck. The measurement campaing is performed in Kosovo, starting from Prishtina to the south-western Albanian border. Knowledge of base station locations and cell load during the measurements is made available from the service provider. 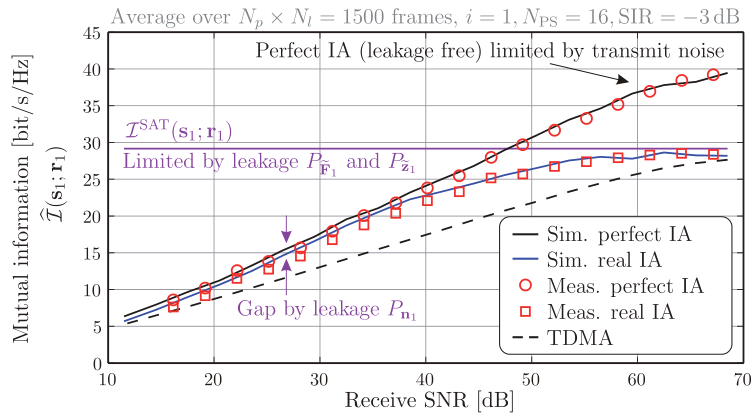 This is crucial to determine whether the bit rate is limited by network availability, cell load, or propagation effects. To provide reliable in-vehicle coverage, it is necessary to determine the penetration loss. In this paper, we present the first results and show that the penetration loss varies by up to 10.58 dB. The VSS is a national Austrian conference for young researchers. 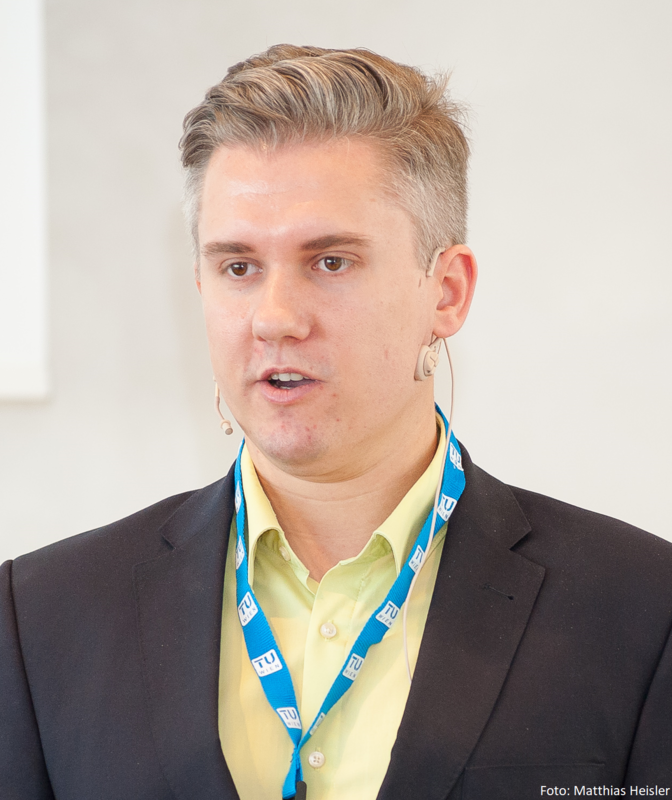 I participated in 2015 and 2016, helped with the organisation in 2016 and 2018, and had the honor to chair the conference in 2017.